The Advances in Applied Probability has been published by the Applied Probability Trust for over four decades, and is a companion publication to the Journal of Applied Probability. It contains mathematical and scientific papers of interest to applied probabilists, with emphasis on applications in a broad spectrum of disciplines, including the biosciences, operations research, telecommunications, computer science, engineering, epidemiology, financial mathematics, the physical and social sciences, and any field where stochastic modeling is used. 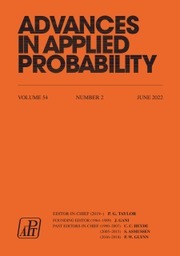 A submission to Applied Probability represents a submission that may, at the Editor-in-Chief’s discretion, appear in either the Journal of Applied Probability or the Advances in Applied Probability. Typically, shorter papers appear in the Journal, with longer contributions appearing in the Advances.